​We're so excited you found us! You probably searched something like photo booth for rent or something similar. The point is that if you're looking for a photo booth rental in Greensboro, NC you're in the right spot. Whether you're having a wedding, birthday party or corporate event our photo booths are sure to be the life of the party. There's a reason why photo booth rentals are becoming one of the most popular rental entertainment activities because photo booths are FUN! Some photo booth companies rent out cheap photo booths that quite honestly are a bit janky. You know, kinda like when you'd hop into your friends 1997 Ford Probe cluttered with Mountain Dew cans and cigarette boxes in the floorboard. C'mon, you deserve better than that. Amiright? We not only rent photo booths for your event but we also offer funny props as well as an attendant to ensure you get the most out of the experience and answer any questions you may have in regards to operating the booth. We're not the only photo booth company in Greensboro where you can hire a booth, but just like Good Time Photo Booth, our photo booth rental cost isn't cheap but we are affordable! You'll discover our photo booth rental prices are worth every penny for the injection of fun and entertainment value they supply to your event. Our #1 tip for selecting a photo booth is research. You can't know what you 're looking for in a photo booth rental without it. If you're unsure of what package you want give us a call and we'll design a package that suits your needs. 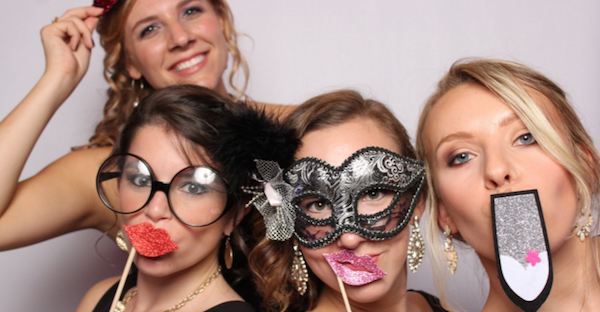 "Here's Why You Should Choose Greensboro Photo Booth Rental"
Unlimited photo booth sessions. Your guests can take as many photos as they choose. Capture memorable photos from your guests they wouldn't normally allow and shots a wedding photographer just can't capture. Obviously we service Greensboro and Guilford County but we provide photo booth service for all of North Carolina including Greensboro, Winston Salem, High Point, Lexington, Kernersville, Jamestown, Oak Ridge, Summerfield, Charlotte and Raleigh. How do I rent photo booth for party? Simply give us a call with your event date, time and hours requested or fill out the above form. Photo booth rental prices vary based on time requested. Yes we require a $200 non-refundable deposit to book a photo booth. Do you provide props with the photo booth? Yes, we provide a trunk full of fun a unique props for your guests enjoyment.